A strong chilling wind has struck the Russian capital over the weekend, upturning trees, damaging rooftops and toppling billboards across the city. The hurricane-like winds will swirl over Russia for a few more days, forecasters say. Moscow emergency services have estimated that at least 76 buildings have been damaged and 32 trees uprooted by wind gusts that reached up to 17 meters per second. Public transportation was partly halted in some areas of southern Moscow after upturned trees damaged overhead lines. 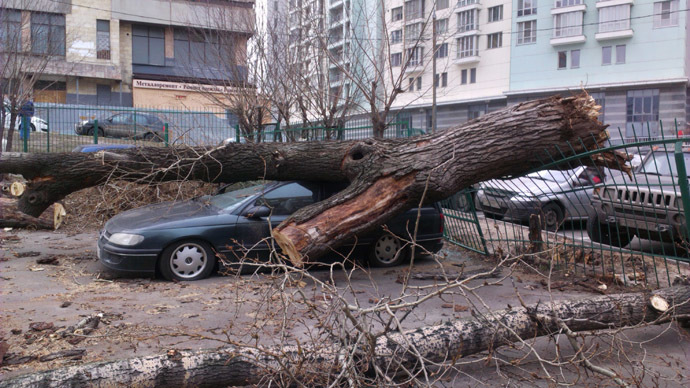 “Due to the strong wind, car owners are not recommended to park near trees and loosely-fastened constructions,” the Moscow city government’s transportation department said in a statement. At least three people suffered minor injuries in the city. A 53-year-old man received a minor injury due to a fallen tree. A 21-year-old woman was taken to hospital in a similar incident. Her condition is now considered satisfactory by doctors. A gusty wind also tore away roof tiles and slightly injured a 27-year-old woman. Over the weekend, witnesses shared pictures of destruction from the affected locations on Instagram and other social media. Besides massive damages, the hurricane-like winds brought to Moscow dust containing dangerous particles known as PM10. Russian Hydrometeorological Center reports that their concentration in the air has already exceeded acceptable limits by 10-50 percent. The World Health Organization called this atmospheric particulate matter the most dangerous contaminant for human health, in for people with chronic lungs diseases, as it could possibly increase the threat of lung cancer. The poisoned air came to Moscow region from lower reaches of the Volga and Don Rivers, where dust windstorms were ranging. The unpleasant ecological situation will last for yet another day. But starting from Wednesday, weather will favor Moscow air’s intense clean-up from dangerous admixture. A specialist from Phobos meteorological center told RIA Novosti that the strong winds may last until Thursday. Weather forecasts have also predicted snow and rain, warning that it may result in icy roads. The local weather services forecast winds reaching up to 25 mps Monday. Heavy wind also affected other cities in the European part of Russia. At least five people were injured in the southern Rostov Region after two passenger buses were blown off the road. About 37,000 people were left without electricity in the region. At least 24 trees were broken in the city of Voronezh, southwest Russia, where the guts of wind reached at least 18 meters per second. On Monday the local meteorologists forecast the strength of the malicious weather phenomena will reach 23 meter per second.